It also came after Russia had accelerated its gold buying in the final months of the Obama Presidency. October 2016 saw an increase of 1.3 million ounces or 48 metric tonnes and this was the largest addition of gold to the Russian monetary reserves since 1998. Indeed, it was the biggest monthly gold purchase in this millennium for the Russian central bank. November 2016 saw another increase of 1 million ounces. 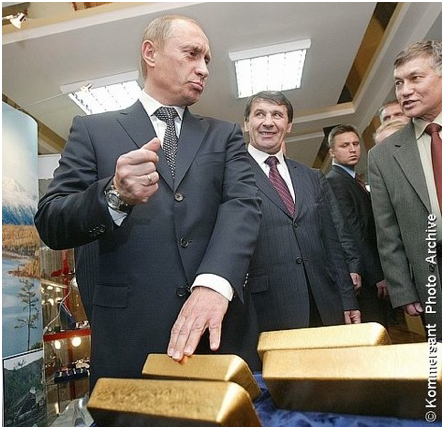 Some analysts saw the increased Russian gold buying as a parting ‘gift’ and warning shot by Putin and Russia to his rival outgoing President Obama and the monetary and financial elites in the U.S.
Russian gold reserves increased a very large 199.1 tonnes in 2016 alone. Concerns about systemic risk, currency wars and the devaluation of the dollar, euro and other major currencies has led to ongoing diversification into gold bullion purchases by large creditor nation central banks such as Russia and of course China. There was silly speculation in 2013, 2014 and 2015 that the financial challenges facing Russia and the depreciation of the ruble could lead to Russia selling some of its increasingly large gold reserves. We pointed out on Bloomberg TV at the time that this was highly unlikely and pointed out that Russia was much more likely to sell some of its very large dollar and euro reserves and was more likely to continue to diversify into gold. Russia has been steadily buying bullion since before the global financial crisis and is now the sixth-biggest holder of gold reserves internationally – after the U.S., Germany, Italy, France and the IMF. The monetary diversification accelerated during the global financial crisis and in recent years. It has more than tripled its gold reserves since 2005 and holds the most gold since at least 1993, IMF data shows. Although, it is worth noting that countries like Lebanon, Egypt, Laos, Pakistan, Kazakhstan and Turkey all have a much bigger share of gold in their foreign exchange reserves than Russia does – suggesting the recent trend is likely to continue. Especially if politics intercedes and the relationship between Russia, Trump’s U.S., the EU and NATO worsens again in the coming months. Astute, risk aware investors are following Russia’s lead by diversifying and having an allocation to physical gold coins and bars. This entry was posted in Industry News and tagged gold demand, Gold Price, Russia.